Prepaid debit cards are a growing niche for the “under-banked” or “un-banked” who can’t or don’t want to use traditional checking accounts to hold their cash. In order to promote the adoption of prepaid debit cards as their sole financial hub, many now offer the option of an attached high-interest savings account. For the purposes of this review, I will not focus on most aspects of the prepaid debit card. I am primarily interested in maximizing the savings account feature and the avoidance of any fees. Account opening process. Visit the Netspend website and enter your personal details to order a card (name, address, e-mail). No credit check. No application fee. You will eventually need to provide your Social Security number as required by law, since you’ll be opening a FDIC-insured bank account. If you are referred by an existing user (links above are mine, thanks if you use it), both get an additional $20 bonus after depositing at least $40. After signing up, you can also refer your own friend and family for more $20 bonuses. Once the physical card arrives in about a week, follow the included directions and activate your account online. You will be provided your unique account number and a routing number, which will allow you to make electronic ACH transfers from your external bank accounts. You can also use this information to have direct deposit set up with your payroll or government benefits. 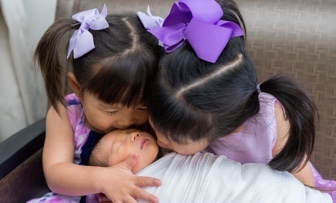 5% APY savings account funding directions. Previously, you had to upgrade to Netspend Premier to get the 5% APY savings account option. This requirement appears to have been removed. You must use an external bank to “push” money over into the Netspend card. I used my Ally Bank savings account as the transfer agent (screenshot below). 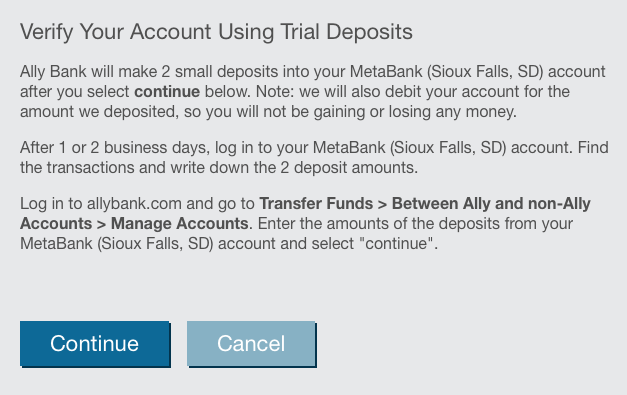 I used the account and routing numbers provided, which confirmed that the underlying FDIC-insured bank is MetaBank of Sioux Falls, South Dakota. Other banks that they say may be used are BofI Federal Bank and The Bancorp Bank. Then, all you need to do is move over $5,000 from your external bank to your Card Balance, and then move that $5,000 over to your Savings Balance. Your Card Balance is the part that can be spent via prepaid debit card, but it will not earn any interest, so be sure to move it over to Savings Balance. They are separate buckets! Here are the before and after screenshots (click to enlarge). The Savings Account has no monthly minimum balance requirement and no monthly fees. Transfers between Card Balance and Savings Balance are free, but the number of withdrawals from Savings Balance are limited to 6 per calendar month by federal banking laws. Account Maintenance Fee $5.95 per month (fee applies if Card Account has not had any activity, that is, no purchases; no cash withdrawals; no load transactions; or no balance inquiry fee for 90 days). If enrolled in any FeeAdvantage Plan and your Card Account has had no activity as described above, this fee applies instead of the Plan Fee. The simple solution to avoid this fee is to load a few dollars once every 90 days via your original ACH transfer source. Most banks will even let you set up an automated transfer schedule; I like every month just because it serves as a monthly reminder to check the balance, APY, etc. You could also use their mobile app and make a check deposit. Withdrawals. The easiest way to make a withdrawal is again via “ACH pull” from your external transfer bank. Remember, you’ll have to move the funds over from “Savings” to “Card”. Another free alternative is to use the BillPay feature and pay down a credit card bill using your funds. If you have a credit card that you use regularly, you can even make an overpayment and simply hold a negative balance until it gets used up by future credit card purchases. Finally, you could just use the Visa feature to buy something or make an ATM withdrawal (subject to daily limits), but you may be subject to transaction fees. Additional cards. If you have a spouse or partner, you could both get a NetSpend Prepaid card which would bring your 5% APY limit to $10,000. There are also other cards which offer a similar setup, including Brink’s Prepaid (I have this one as well), Ace Elite, and Western Union. If you had one of each of these (which is still allowed to the best of my knowledge), then that would bring your theoretical limit to $20,000 for an individual or $40,000 for a couple. Recap. Yes, it really works, as long as you set it up properly and maintain an active account. As compared to a 1% APY savings account, each $5,000 balance at 5% APY would earn $200 more in taxable interest income each year. It is up to you to weigh the potential reward vs. effort, also taking into account the size of your cash balances. I’m interested in doing all four of these if you have referrals on the other 3 as well. You are only eligible to receive one bonus. Your other accounts won’t get the bonus. Not sure what you mean by that- they are all different companies why wouldn’t you get a referral bonus for each??? They’re all run by the same company. Jonathan, I really enjoy reading your blog. I used your information to open an Everbank account, getting 6% APY for 6 months. Is there a time limit on these as well? If not, this seems like a great deal for some minor account maintenance. Thanks! 6% or 1.6% ??? Please let us know. Oops! Sorry. It’s 1.6%. Though still better than the next-to-nothing that a lot of banks are giving. What are the options for getting money out of the account? Can you transfer out via ACH, or just bill pay, ATM withdrawal, or store purchase? Nice GUI interface, but only limitation is u can transfer only $5K in per day from another bank. Hi xmasy and Rick – Does radiusbank treat the first $1K credit card payment as a Regular Purchase or Cash Advance? It makes a difference in additional credit card fees if it is processed as Cash Advance? Hi xmasy and Rick – I plan to open the account and use you as a referral to take advantage the bonus program. Signed up for the netSpend and tried to sign up for the Brinks second. I got the message on the Brinks that I already requested a card. Looks like maybe only one is allowed. You have to go through the complete process with one card at a time. Once you finish activating and depositing, you can open a second account. There is another prepaid debit card company with a savings account at 5.00% APY. Insight Visa® Prepaid Debit Card is issued by Republic Bank of Chicago, Member FDIC and Axiom Bank®, Member FDIC, pursuant to a license from Visa U.S.A. Inc . The Insight Savings Account is made available to Cardholders through Republic Bank of Chicago or Axiom Bank®, Members FDIC. As of January 1, 2015, the Annual Percentage Yield (“APY”) is 5.00%. Does anyone have experience with the Insight Visa Prepaid Debit Card and the savings account? I don’t see anything on Brink or Netspend’s website that talk about the 5% interest. Any help with a link where it actually describes this benefit? Jonachan – I clicked your link to order the card. After completed the basis name/address info the next web page says “Please enter a valid date” and won’t continue the order. Is there essentially zero fraud protection with these types of cards? Jonathan, do I need to set up a direct deposit from my payroll in order to open a savings account in netSpend (including the other cards like Brinks, AceElite, and Western Union) to receive the 5% interest rate? It’s kinda hard to tell from the Brinks website. It’s a little vague, but it looks like you might have to have a “Brink’s Preferred” account to access the 5% savings account (which we don’t want because the “Preferred” plan has a monthly fee). Plus, that might (again, it’s vague) require a direct deposit. It looks like the netSpend card is a better bet. The Brink’s card advertises the 5% savings account right on the main page and therefore it appears to have more hoops to jump through. The netSpend card buries the 5% savings account feature a few clicks in, so that might be why it requires fewer hoops to jump through. According to the link Jeff posted “http://thefinancebuff.com/netspend-5-percent-savings-account.html”, it looks like you can have 3 netSpend accounts. I don’t know yet because I’m still waiting to activate my first one, but I would rather have 3 netSpend accounts before I even bother with the Brink’s account. You don’t need to pay a monthly fee for Brink’s 5% APY (at least I don’t), but some reports state that now you do need one “real” direct deposit from a paycheck or government source to qualify for the savings account. A few months ago, you could just ACH from CapOne 360 or Ally Bank. 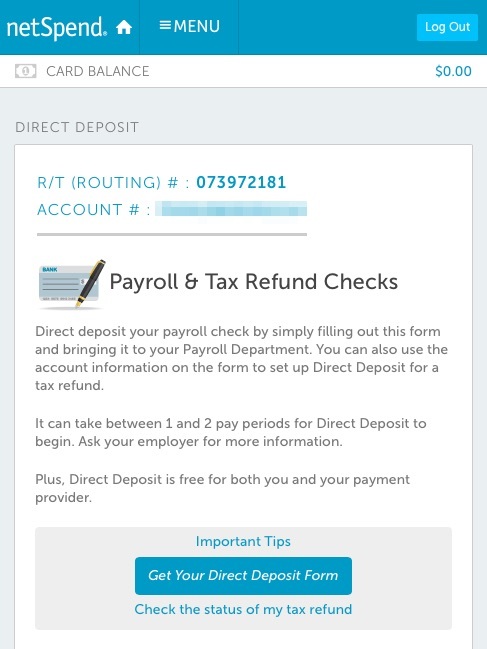 NetSpend supposedly still allows ACH to count as direct deposit. That’s the main problem with these little niche accounts. The rules are not clear, they are not stated transparently, and thus they can change at any time. You must rely on online reports, which can often conflict or be out of date. I personally don’t like the risk of having NetSpend shutting down “all but one” of my accounts, and thus I like having different ones. Thanks for sharing this Jonathan. Have you actually used an ACH “pull” to get your money back from the “card” portion of your Netspend account? I ask because the site doesn’t really specify that you can do this, and all other ways of getting your money out look like they may incur some fees. I have, for a small test amount, and it worked (didn’t want to pull all my money out). Some people have reported success on large amounts, others have reported problems on some cards for large amounts, but I think the free BillPay option is a viable alternative. You can just use it to pay your credit card, utility, or insurance bills. If I needed the money, the reason (medical, pet, car repair) would probably be charged on a credit card first anyway. If you think you may need cash right away, then you may reconsider using this card. Just be sure to wait until one is activated before trying to get a second one. You need to create another login for each account, and the bonus will only apply to the first one. I followed your link and setup my first account, and received the $20. Hope you get yours also. You stated can have up to 3 Netspend account. 1) Does this mean each one with a separate login in (yet same SS)? 3) What stops from adding the 4th and 5th? As always, you hav a great blog and I have learned and gained over the years. Yes, 3 accounts with a separate login with the same SSN is what I have. Only the first one will get the bonus, as they appear to be tracking that by SSN. I think the same reason applies as to why you can’t get a 4th account. I haven’t tried, but went off of what The Finance Buff blog said that 3 accounts per person is their policy. I had just started investigating these offers. The conditions and possible fee traps make my head spin. Can I just get my “free” $20 be done with it? At least sounds like a quick 20. Like I said in my earlier comment I had already investigated (and went forward) with setting up the card to at least get the $20 bonus. Wow! The FEES!!! For everything imaginable. Now I know how they can afford to give you such a generous bonus. They charged me $1.00 for using the card. Fees for getting your money back. I am fully aware that you can upgrade to another account where they won’t charge as much money. I am all for capitalism but this is ridiculous. I wish everyone good luck with this. The 5% return is not enough for me to give more money to these companies. I used your link to open a Netspend account and after I got the card, I got an email from them saying that I wasn’t eligible for the bonus as I was a prior netspendaccount holder. I called them back and told them that I’ve never had a Netspend account. They said that I have to get a referral code now. This is ridiculous! I got the exact same email before funding my account (but have never had a netSpend account before). When I called that same day, I got a helpful (but hard to understand) CSR. She put me on hold for a while and eventually came back and said I was eligible for the referral bonus. A few days later when I funded my account, the bonus showed up the same day. Might be worth another call or asking for a supervisor. I tried to move money in to netspend through my everbank, TD Ameritrade and Paypal accounts. In all three cases, it would not accept the ACH information provided by netbank, so it seems they are on some sort of blacklist. Until this is resolved, I recommend staying away. Neither PNC nor EverBank let me add NetSpend account as an external account. The two small deposits method was rejected. Jonathan – I finally opened an account with your ink. Many thanks. Just a comment for the readers on the Netspend topic. I just found out you can’t have a beneficiary on the Savings account. They don’t offer a beneficiary designation. So I wonder what happens if the account holder happens to dies and is single? I guess the rules in the state you died in are followed. Can get complicated I imagine if the unthinkable happens. I recently received my Netspend card and was about to transfer $5,000 into the accompanying savings account when I noticed that their terms are changing on 7/1/16 (pasted below). It looks like they are reducing the maximum balance eligible for the high interest rate from $5,000 to $1,000. Has anyone else heard about this? Maybe this is not applicable to Netspend Premiere? If the Average Daily Balance is $5,000.00 or less, the interest rate paid on the entire balance will be 4.91% with an Annual Percentage Yield (APY) of 5.00%. If the Average Daily Balance is more than $5,000.00, the interest rate paid on the portion of the Average Daily Balance which exceeds $5,000.00 will be 0.49% with an APY of 0.50%, and the interest paid on the portion of the Average Daily Balance which is $5,000.00 or less will be 4.91%. The APY for this tier will range from 5.00% to 0.72%, depending on the balance in the account. Darn, Just when I got signed up with multiple cards. I think I killed it. I haven’t received the notification but am planning on closing my account as of 7/1. Does anyone have any advice as to how to close the account without paying the $5.95 fee? I guess if I transfer everything out first, I don’t have to pay the fee? To close your account and have any remaining funds sent to you by check, please verify your address below. We will return the funds to you (minus the $5.95 check request fee, as disclosed in your Cardholder Agreement) within 10 business days of your request. We cannot fulfill partial payment requests. Checks are made payable to and mailed to the primary accountholder. If your Account does not have enough funds to pay the check request fee, we will not send you a check. Jonathan concluded the setup w/ this step… “Then, all you need to do is move over $5,000 from your external bank to your Card Balance.” (with Ally as the external bank). I am facing two major issues with this. I am experienced with prepaid cards and the many ways to transfer funds. 1. In order to transfer funds from bank (let’s say Ally for example) first you need to “link” the external Netspend account. But the Netspend account won’t accept incoming deposits/verification until you’ve activated the card mailed — which is just for debit/checking account. How can this method be used to make the opening deposit to Savings ? #2 is the more challenging issue and I’ve seen another reader post above without any responses. Without an Ally account I’ve been unable to setup this “external account” using DD info. I’ve tried WellsFargo, PayPal, Amex + Serve, Chase, Union Bank.. I cannot successfully link this. All replies indicate invalid or “error”. However, in the past I had successfully linked other MetaBank a/o Bancorp (prepaid “checking”) accounts for DD transfer; this routing number does work and it should be MetaBank or Bancorp (depending on the debit card logo issues). So there must be something in the ACCOUNT # which indicates invalidity? Other than Ally, any other banks you’ve had success with? With #1, Once you activate the card, you set up your link with a trial deposit and once you verify the deposit has taken place, you are able to transfer to the card as a deposit. #2. Not known why the more major banks are rejecting these vaild routing numbers but it is probably not a coincidence that they are competition and they want to try to discourage use. The higher yield online banks are a better bet as they seem more willing to allow these transfers possibly because they are in the smaller universe. It the routing number that causes problems. They do not like the bank you want to transfer to. Perhaps it is because they are not in the list of routing numbers they have in their system because they are smaller banks. Brink’s has also reduced the 5% savings limit to $1000.